We start with some essential pan preparation. 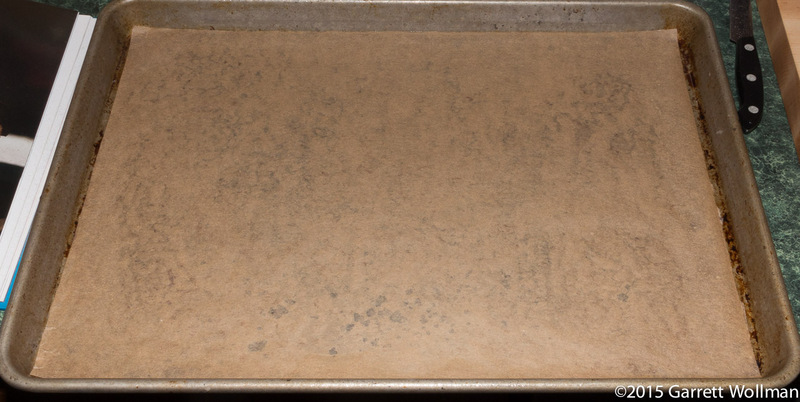 The recipe calls for a “13-by-18-in/33-by-46-cm rimmed baking sheet”; I don’t have anything that size, but after a reading the directions a few times over, I determined that a normal half-sheet pan would do just fine. (That might even be the pan she actually meant to call for, in which case all I can say is that her tape measure is miscalibrated!) I cut a sheet of baker’s parchment to fit the bottom of the pan, and used a bit of baking spray to adhere it to the pan while the cake batter was being prepared. 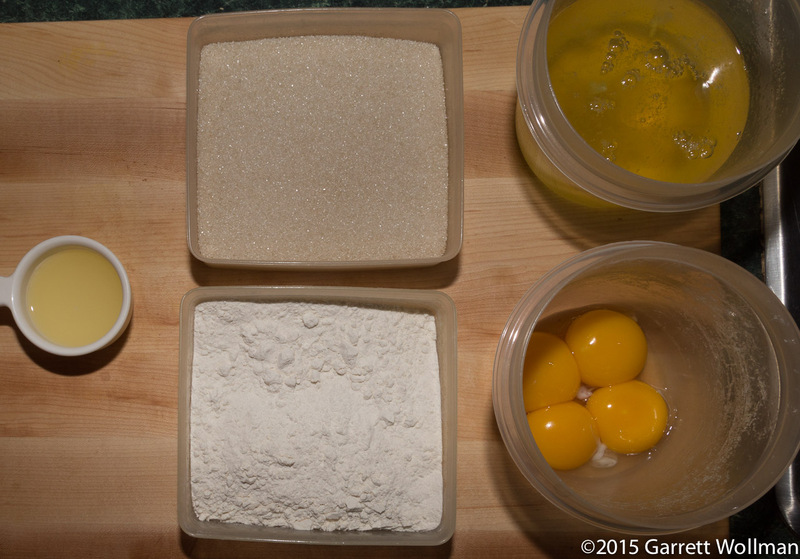 The ingredients for sponge cake are absurdly simple: eggs, sugar, flour, lemon juice, and a pinch of salt. 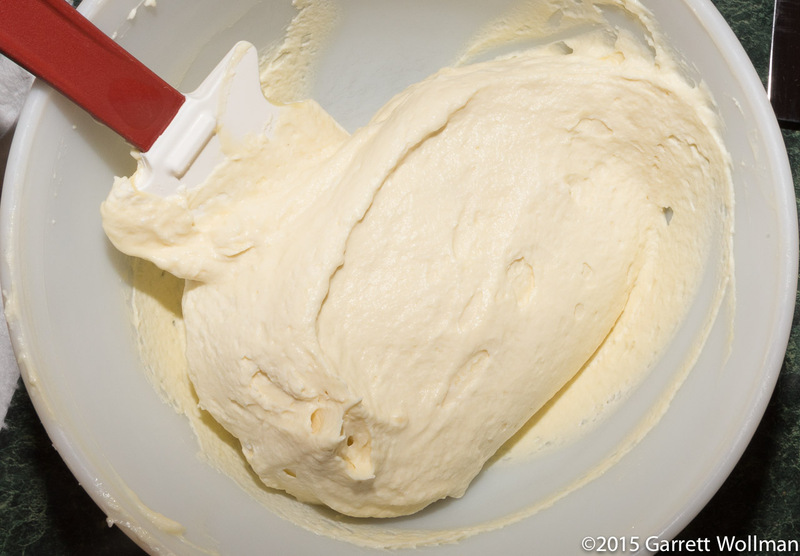 The recipe requires four egg yolks, but seven whites; luckily, I had already made the pastry cream, which uses four additional yolks and no whites. The sugar (200 g) gets added to both the yolks and the whites, separately; the flour (a mere 90 g) is added at the very end. I bet you could see this coming: the eggs get beaten together with the lemon juice and a quarter of the sugar for a few minutes until they lighten in color and reach the ribbon stage. 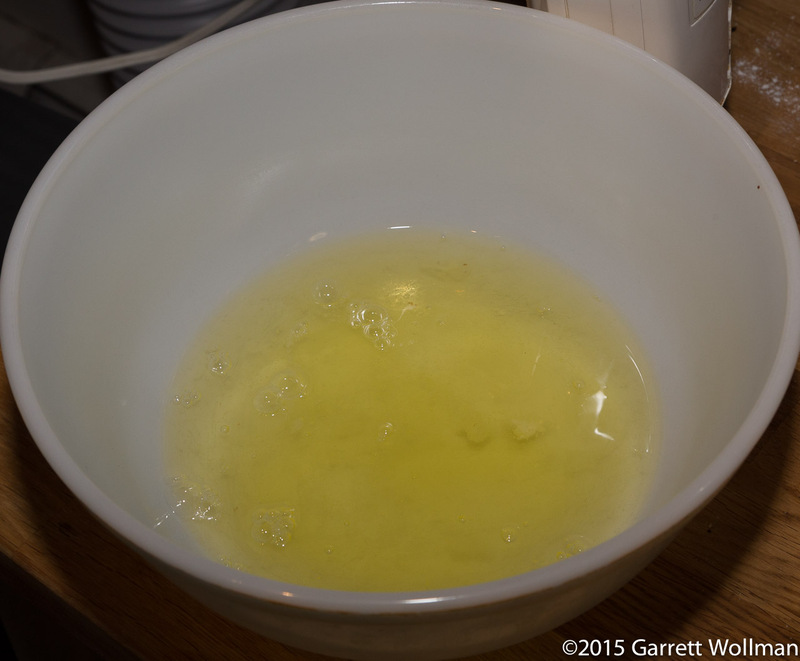 This doesn’t work so well in my stand mixer because the bowl is so large compared to the volume of four eggs, but the whites are supposed to be added to the yolks, so…. 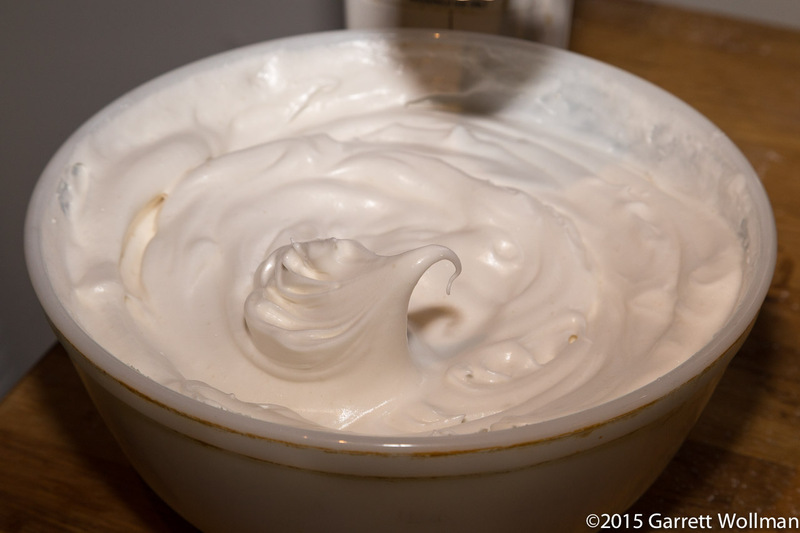 The meringue made from those seven egg whites comes nearly to the top of my mixing bowl. (In fact, several times I was afraid that it would overflow and spill out over the work surface.) 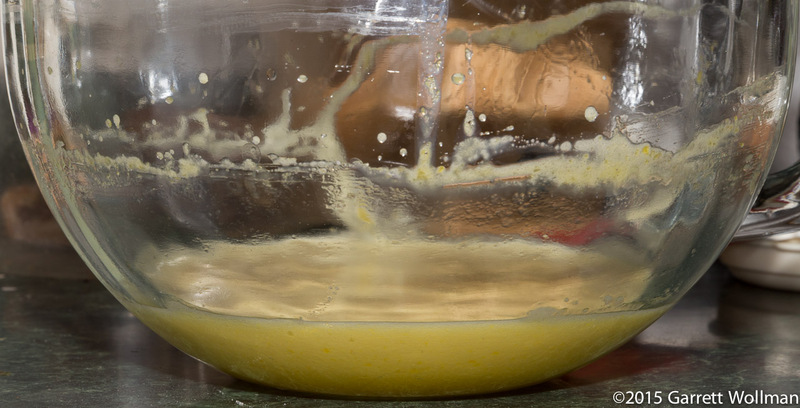 This is folded in the usual way into the egg-yolk mixture, taking care not to deflate the air bubbles in the meringue, and then the flour is sifted over the top of the egg mixture along with a pinch of salt and carefully folded in until just mixed. The finished batter is then carefully poured onto the prepared baking sheet and spread into an even layer, making sure to get all the way to all four edges. Minor imperfections in the surface of the batter don’t make much difference (they’ll be hidden by the filling), so long as the overall thickness doesn’t vary too much and there are no large voids. The sponge cake is baked in a 350°F (175°C) oven for 18–24 minutes, until an even, light golden brown on top. When the sponge comes out of the oven, it must sit in the pan for about five minutes to set up, and then it’s inverted onto another sheet of parchment, so that the (flatter) bottom surface of the cake becomes the top. After carefully removing the top parchment, you’re left with a thin, evenly colored, unflavored sponge cake that can soak up a flavorful syrup — like the coffee syrup Chang suggests, or in my case a vanilla syrup (70 g of vanilla sugar mixed with 80 ml of boiling water, stirred until the sugar is dissolved, and then allowed to cool to room temperature). The cake is first cut in half along both axes, to create four rectangles of nearly equal size, and then painted with the syrup using a pastry brush until all of the syrup has been absorbed. Now on to the filling. Chang makes a plain whipped cream which is then flavored with pastry cream (previously made and refrigerated, and not shown here — I’ve done Chang’s pastry cream before). 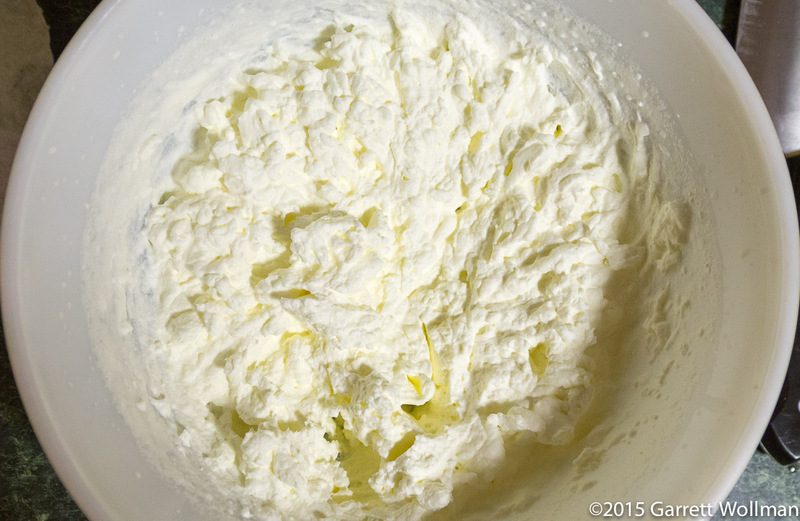 In order to stand up to the heavy pastry cream, the whipped cream must be whipped quite stiff, more so than you would normally want when whipping cream as a dessert topping. We start with a cup (240 ml) of heavy cream, and then fold in 400 g of pastry cream, and the result is this lovely yellowish filling that has all the custardy flavor of the pastry cream but is not nearly as dense thanks to all the air that has been whipped into the cream. Once again, it’s important to fold carefully, both to limit the degree to which the bubbles will be deflated, and also to ensure that no unmixed cream lingers at the bottom of the bowl. 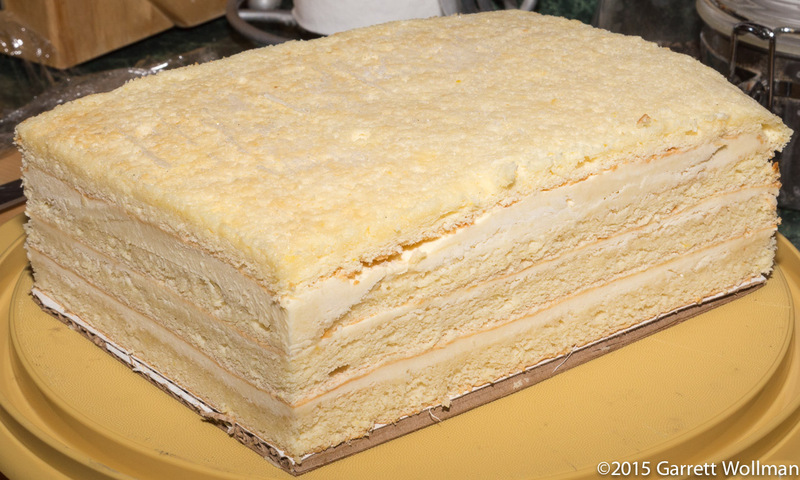 The cake assembly is pretty simple at this point: the four rectangles of sponge cake are stacked, syrup side up, with about a third of the cream filling separating the interior layers. Chang recommends using a piece of food-grade cardboard (like a cake round cut to a rectangular shape) to support the bottom layer. The photo above shows the first layer. 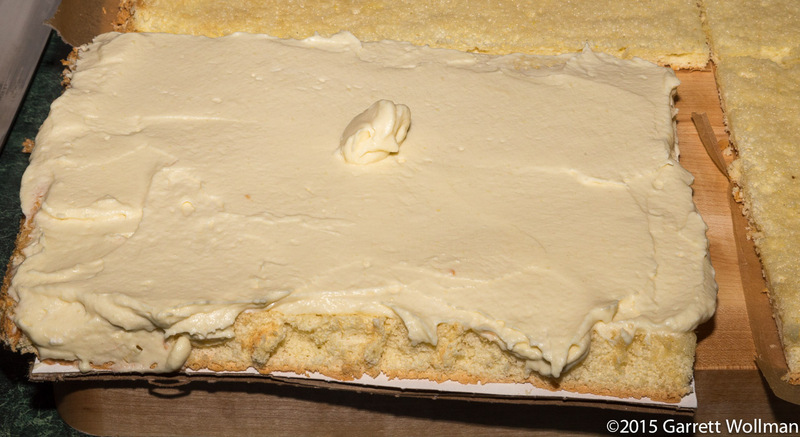 It’s important to get the filling spread evenly across the sponge cake, because any unevenness will get magnified as the succeeding layers are stacked on top. I forgot to weigh the filling, which I normally would have done to ensure that I came reasonably close to dividing it in thirds, and as a result my bottom layer was a bit skimpy. Once the entire cake is assembled, it is wrapped loosely in plastic wrap and frozen overnight (or at least until completely solid). The following morning, the frozen cake is removed from the freezer a few hours before serving time and the edges are cut clean with a warm chef’s knife. The trimmings can be left out to thaw for later eating by the baker! The cake is covered with a chocolate ganache made from 115 g of chopped 60% chocolate (I used Callebaut L-60-40NV) and half a cup (120 ml) of heavy cream, which has been allowed to cool completely and was then warmed just to the point of flowing. When it hits the frozen cake, the ganache immediately starts to stiffen up, so it’s important to be ready to spread it quickly over the top. It is not intended that the sides be completely covered. Chang’s headnote says “serves 4 to 6”, but I cut it into eight slices, and of course my coworkers who got the rest of the cake cut it into even smaller pieces. I think eighths are the largest servings I would be comfortable with, given the calorie toll and the amount of saturated fat in this recipe. 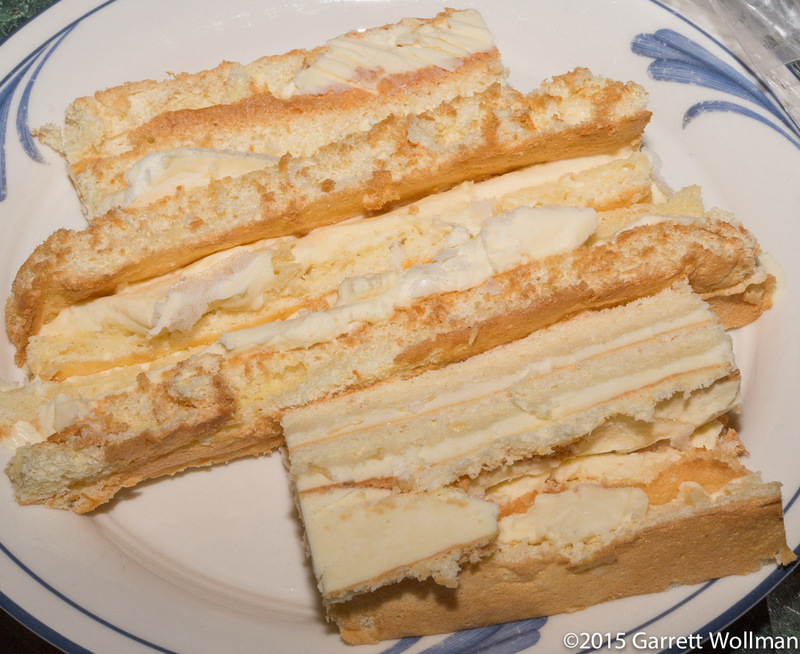 Gallery | This entry was posted in Food and tagged cake, Joanne Chang, recipe, sponge cake. Bookmark the permalink.